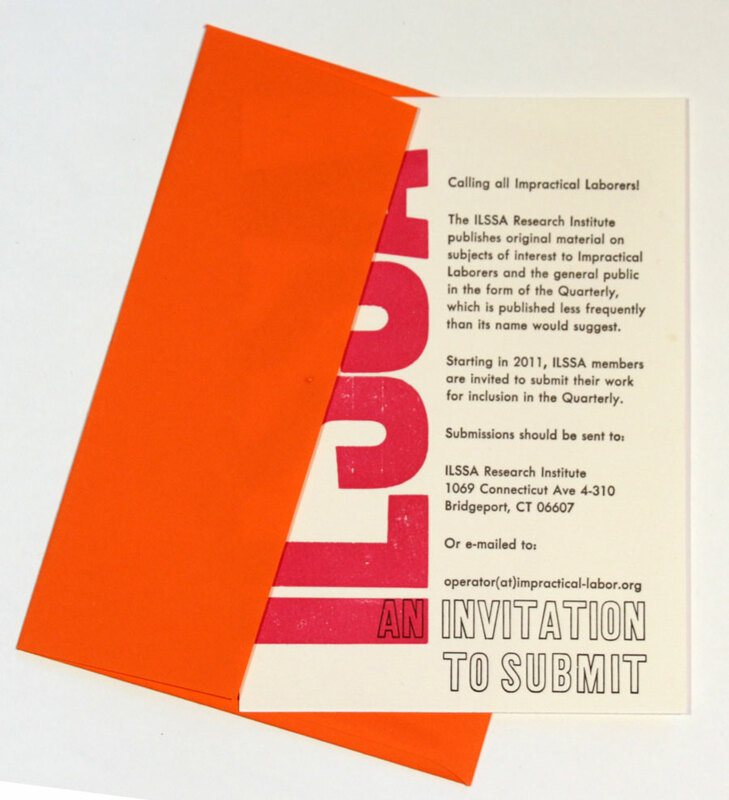 Publishing the ILSSA Quarterly has been a core practice of ILSSA since our founding in 2008. The Quarterly, which comes out with much less regularity than its name would suggest, often includes a call-and-response in which members are asked to do something; that something then becomes the basis of an exhibition or a publication in a future Quarterly. 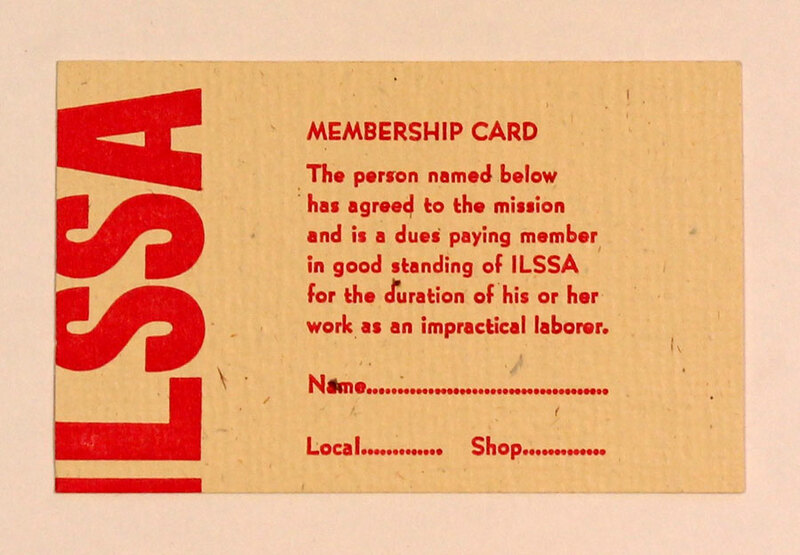 ILSSA member-subscribers receive the Quarterly in the mail; non-members are also welcome to subscribe. You may order all available back issues at a discount when first subscribing, or choose from what is available below: prices include shipping in the USA. Institutions, please note that you may subscribe to Impractical Labor in Service of the Speculative Arts as a periodical through EBSCO! 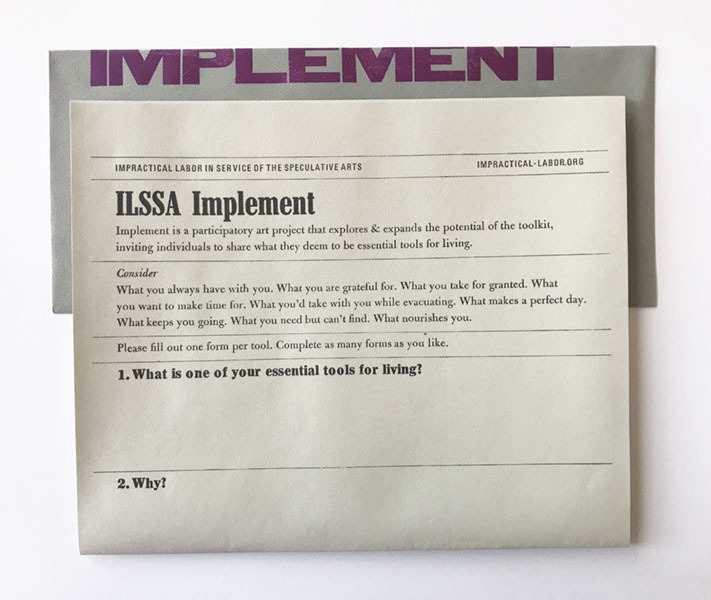 ILSSA Implement is a participatory art project that explores & expands the potential of the toolkit, inviting individuals to share what they deem to be essential tools for living. Developed at a fall 2017 residency at Visual Studies Workshop (Rochester, NY) and explored at ILSSA's 10 year retrospective As Many Hours As It Takes! 10 Years of Impractical Labor at Ringling College (Sarasota, FL) in early 2018, Implement was the first ILSSA project to be completed by the general public before ILSSA members. Set in handset type by Local 917 Shop RC Emily Larned at the Flower City Arts Center (Rochester, NY) and Riso printed by Local 347 Shop FS Bridget Elmer. 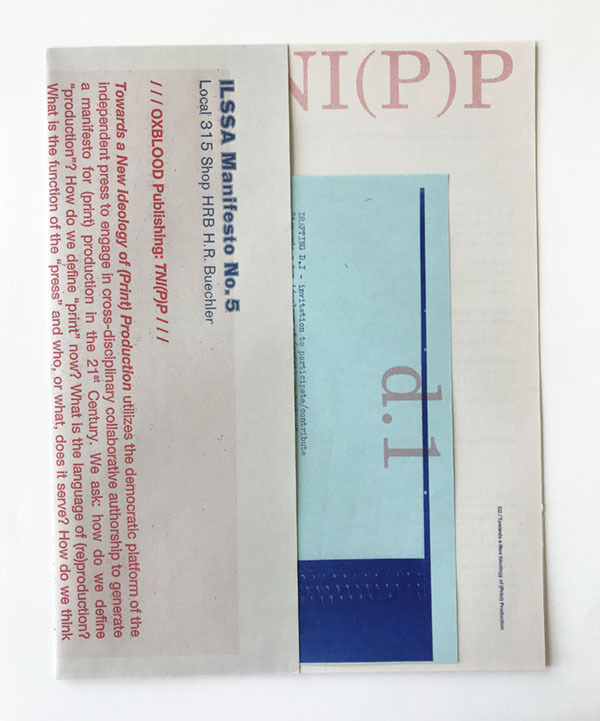 Envelope designed & typseset by 917 RC and letterpress printed by intern Junyi Wu at the ILSSA Bpt HQ. Included in current Quarterly, join to receive. ILSSA Hands & Tools documents the 2013 exhibition (by the same name) at Harvest Records (Asheville, NC). The original show was installed as a part of the inaugural ILSSA Convergence. Five years in development, the careful rumination behind this project was the inspiration for ILSSA Implement. Designed, Riso printed, and handbound by Local 347 Shop FS Bridget Elmer. The 5th installment of the ILSSA Manifesto Project. Capturing Local 315 Shop HRB H.R. Buechler's (Oxblood Publishing) TNI(P)P project in mid-development, this Manifesto consists of two iterations of Buechler's project, along with explanatory text. 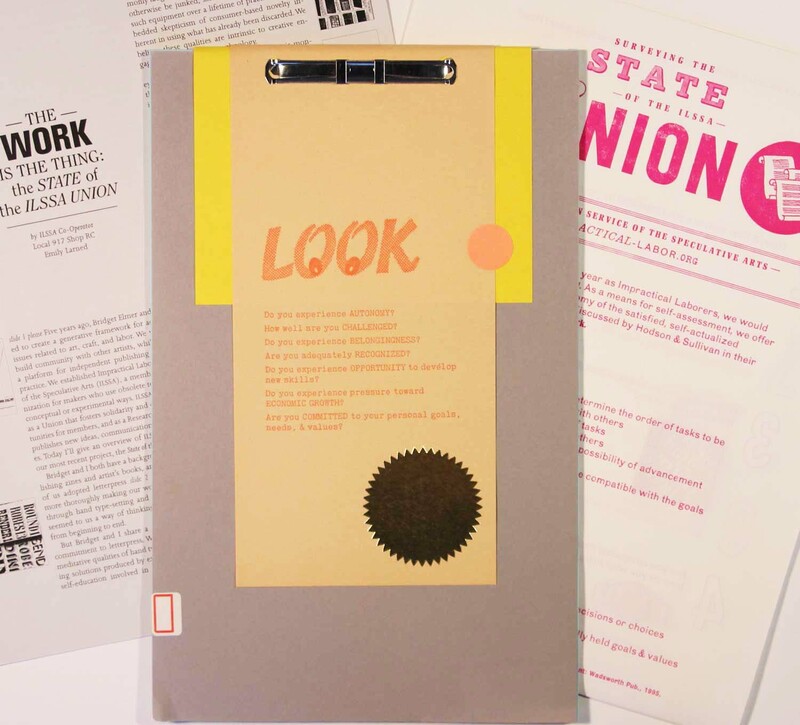 Original documents redesigned into a nested publication and Riso printed by Local 917 Shop RC Emily Larned. Letterpress printed and hand folded by ILSSA Bpt intern Junyi Wu. The 4th installment of the ILSSA Manifesto Project. A manifesto created shortly after Trump's inauguration. Local 857 Shop SRL Sarah Rose Lejeune's original was a drypoint etching on handmade paper; ILSSA's version is Riso printed by Local 917 Shop RC Emily Larned and letterpress printed and hand folded into an accordion by ILSSA Bpt intern Junyi Wu. The 3rd installment of the ILSSA Manifesto Project. Typewritten on a Czech typewriter by Local 917 Shop HC Meghan Forbes (of Harlequin Creature), riso printed by Local 917 Shop RC Emily Larned, and letterpress printed by ILSSA Bpt intern Amanda Fernandez. The 2nd installment of the ILSSA Manifesto Project. 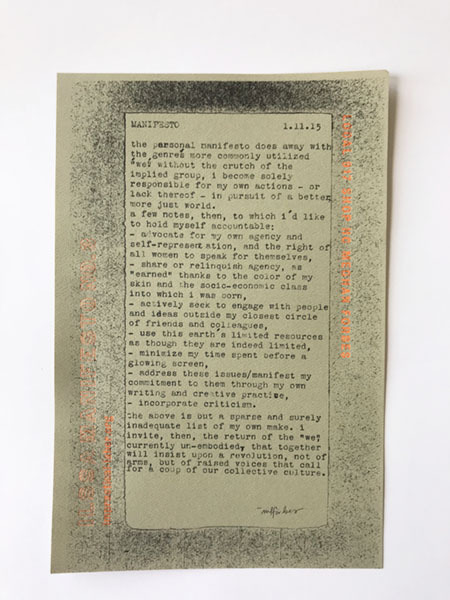 A manifesto comprising phrases Local 413 Shop 29P Melanie Mowinski's students collected over the course of a semester, which "hopefully motivate and inspire those on any creative path." 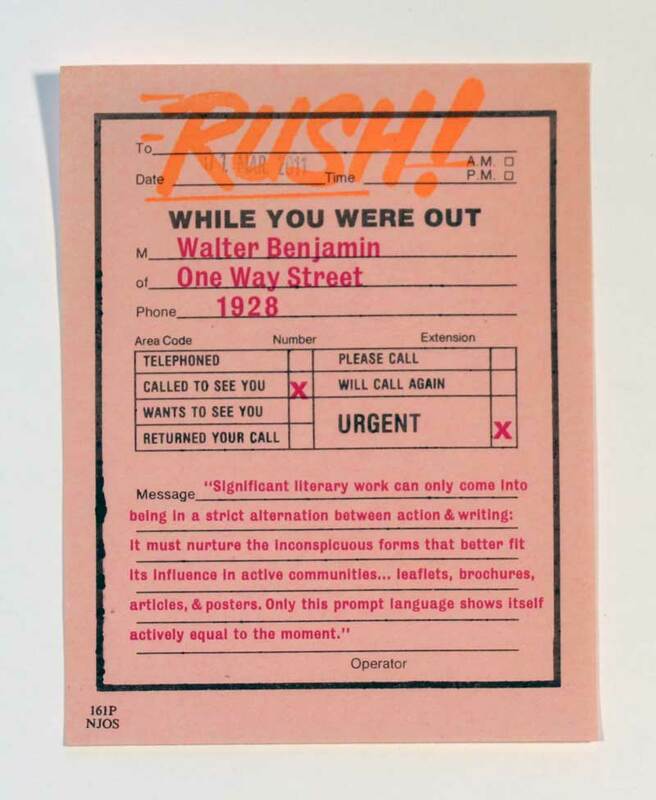 The concept of turning them into shuffable cards (similar to Brian Eno's Oblique Stratgies) comes from ILSSA Manifesto Editor Local 717 Shop WP Meghan Reedy. Designed & letterpress printed by ILSSA Bpt intern Amanda Fernandez. 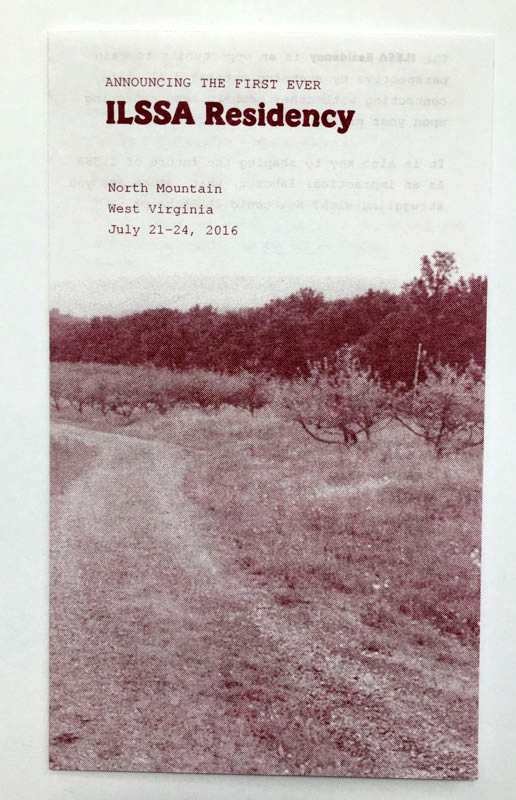 Food for the body and food for the mind: a do-si-do booklet documenting the meals eaten and the resources shared at the first ILSSA Residency, July 21-24 2016 at North Mountain Residency in Hedgesville, WV. Designed and riso printed by Local 917 Shop RC Emily Larned, handsewn by ILSSA members & friends at Visual Studies Workshop in Rochester, NY. 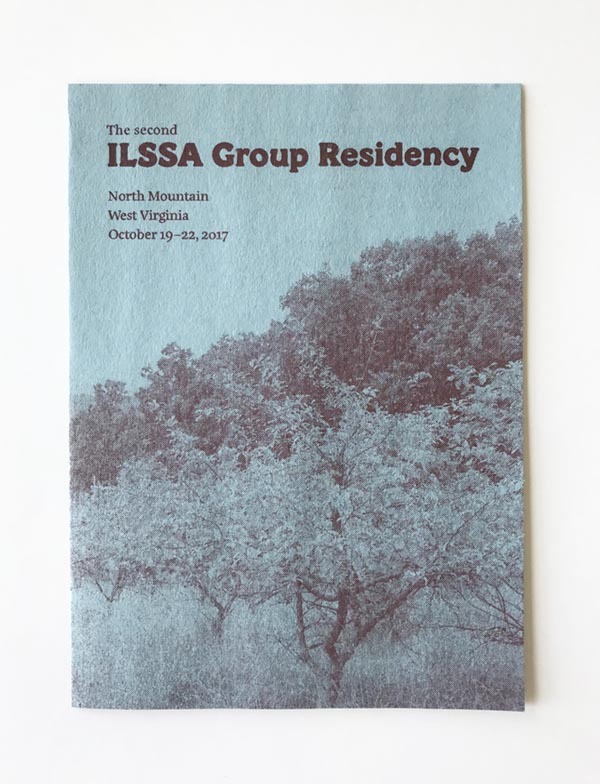 Announcing the schedule of the 2nd annual ILSSA Residency at North Mountain in Hedgesville, WV. 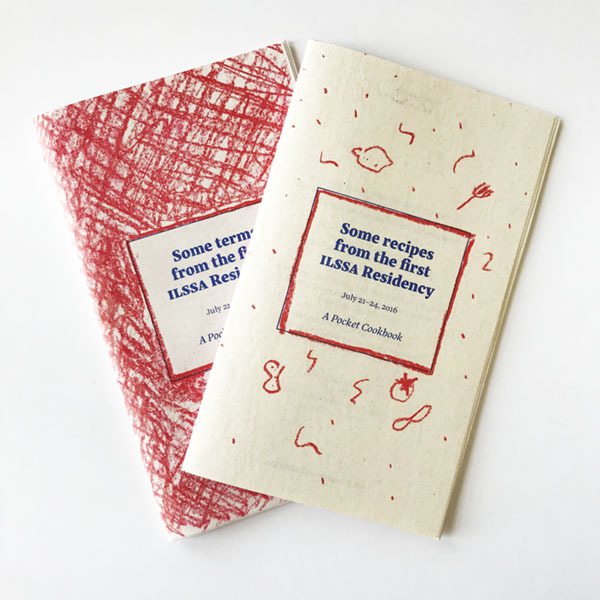 Skillshares in abhyanga, fermentation, and bookmaking, anyone? Designed and riso printed by Local 917 Shop RC Emily Larned. 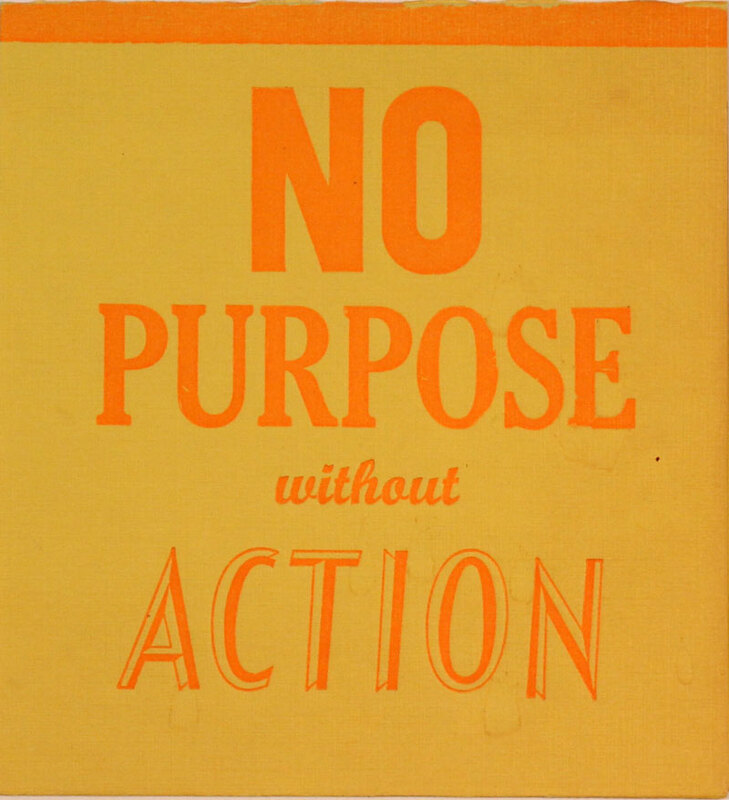 A rotational poster for your workplace. 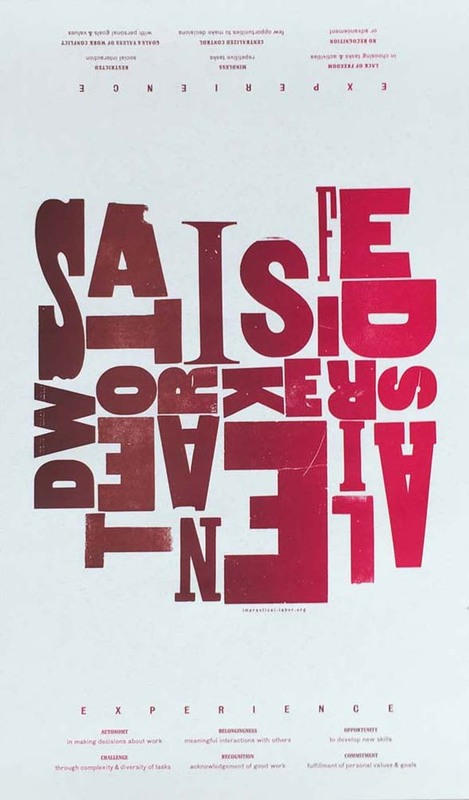 Hang it one way such that "Satisfied Workers" reads right-side up, along with the conditions that make for a satisfying work experience; or orient it the opposite way such that "Alienated Workers" reads right-side up, along with the corresponding conditions. Designed and printed letterpress from handset wood and metal types by Local 917 Shop RC Emily Larned. Are you always +2 at 11am? A chronobiological self-test designed to track and identify personal time cycles, based upon an experiment designed by Local 503 Shop JL John Labovitz. Collaboratively written by Local 503 Shop JL, Local 347 Shop FS Bridget Elmer, and Local 917 Shop RC Emily Larned. Designed to mimic a vintage US Army Field Manual, printed risograph in 2 colors, and bound by Local 917 Shop RC. 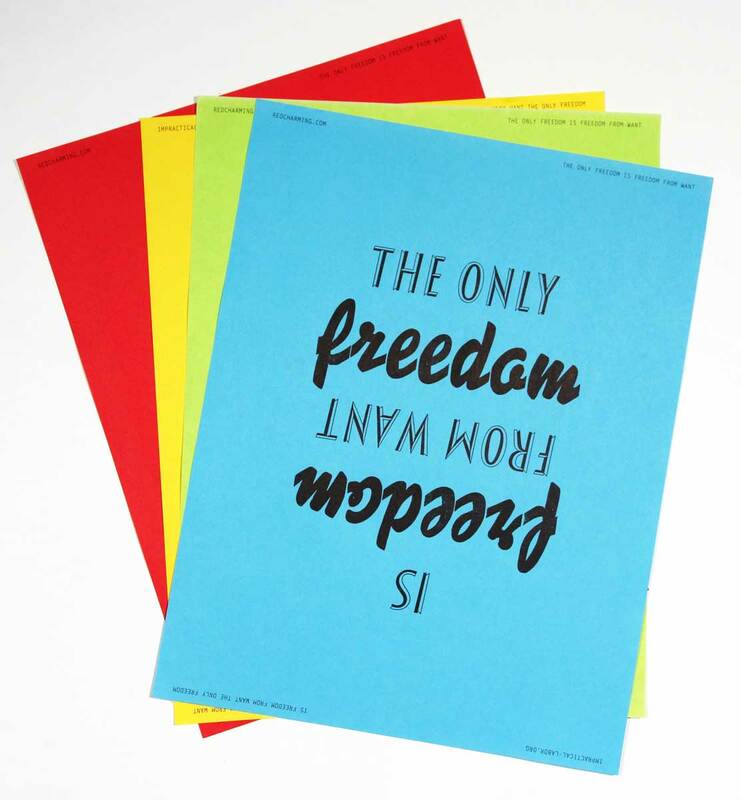 Includes 22 page manual, test form, reply form, and letterpress printed envelope. 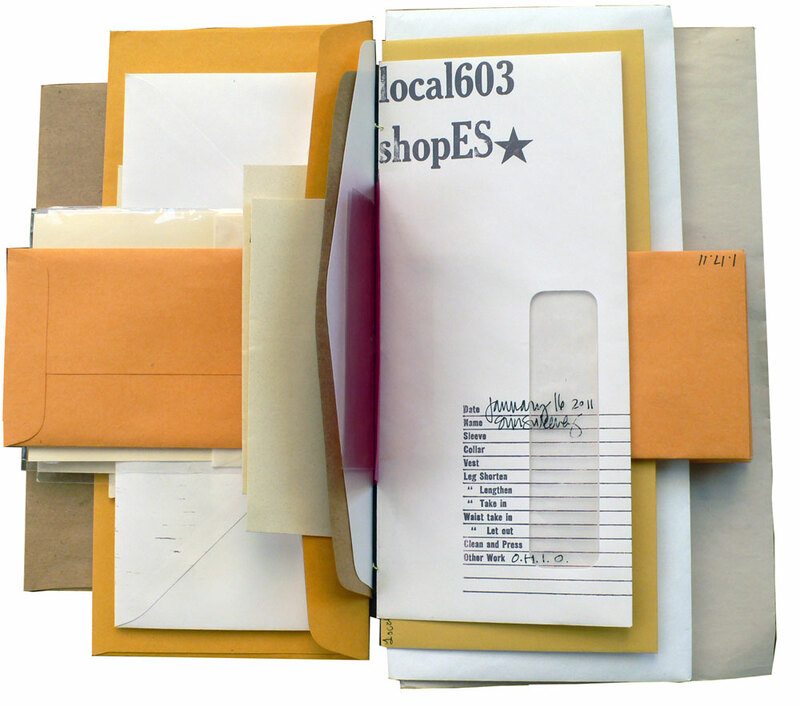 For several years, Eric Asboe and John Engelbrecht operated ALLS (A Literal Letter Service), in which they wrote letters on-demand. The enclosed letter was written in response to ILSSA's request for a rumination on time and money. Though ALLS is no longer in service, we are delighted that Eric remains a member of ILSSA as Local 402 Shop PHCH. Original letter and envelope scanned and digitally printed. 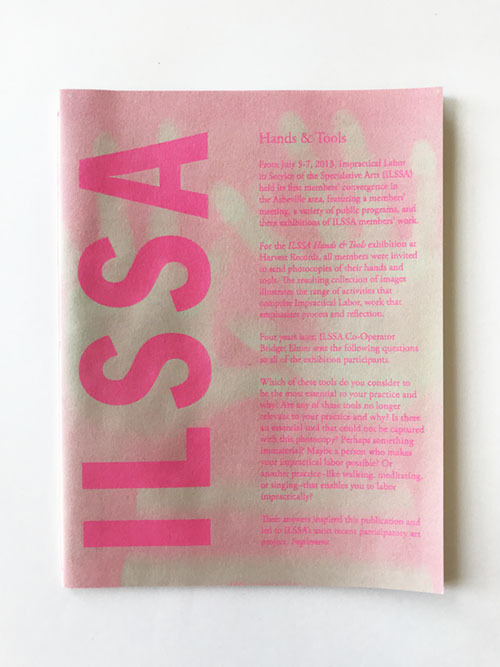 A small Risograph leaflet announcing the first ever ILSSA Residency at North Mountain, WV: the ILSSA Group Residency is an opportunity to gain perspective by stepping outside daily life, connecting with other members, and reflecting upon your practice in a shared context. It is also key to shaping the future of ILSSA. 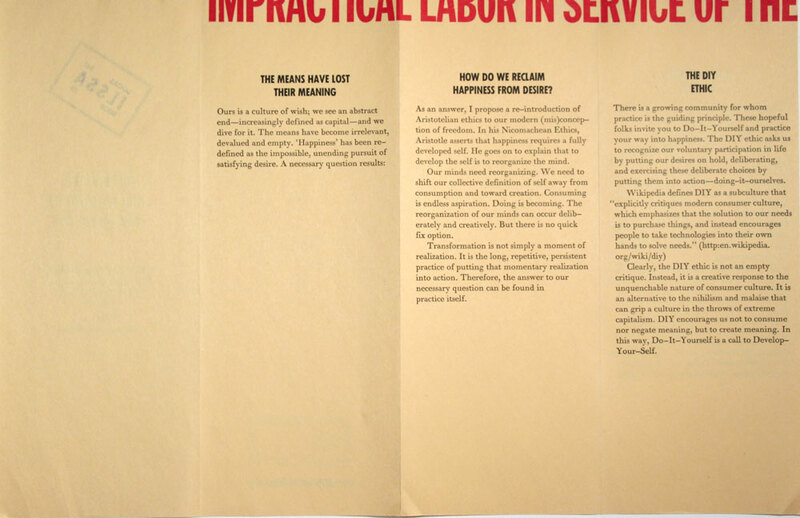 As an impractical laborer, what issues are you struggling with? How could ILSSA help? Designed and risograph printed by Local 917 Shop RC Emily Larned; photography by Local 503 Shop JL John Labovitz. 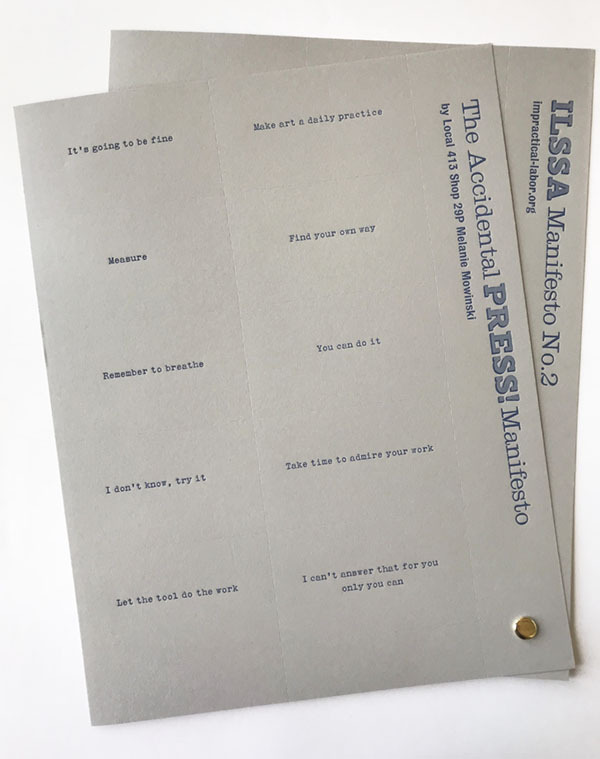 A call for all members to write their manifestos and submit them to ILSSA for publication; the beginning of the ILSSA Manifesto Project. 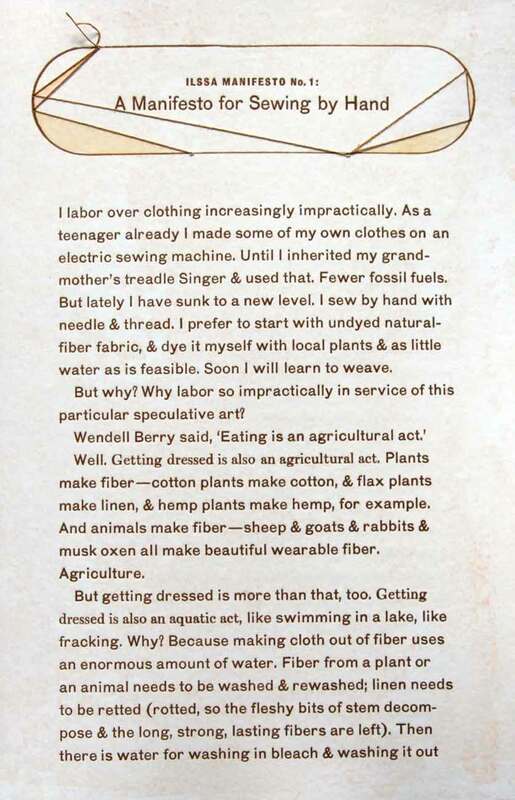 Written by Manifesto Editor Local 717 Shop WP Meghan Reedy, designed & printed by Local 917 Shop RC Emily Larned. Handset type and cuts printed letterpress on vintage engraved certificates. The first installment of the ongoing series, the ILSSA Manifesto Project. Written by Local 717 Shop WP Meghan Reedy, designed & handmade by Local 917 Shop RC Emily Larned. Handset type, letterpress printed on thick hand-stained paper; each copy out of the edition of 325 is unique, with hand-watercolored and hand-sewn ornaments on all 4 pages; Local 917 Shop RC also hand-dyed the sewing thread with natural dyes. Truly a labor of love. A lovely essay on how artmaking cultivates attention and being present in the world. Written by Local 719 Shop NLP Aaron Cohick of the NewLights Press. 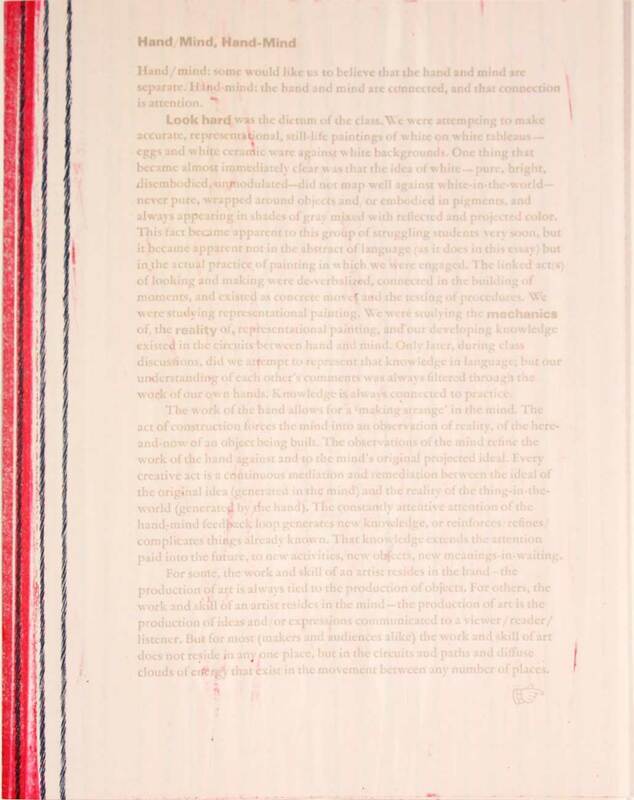 Originally hand typeset and letterpress printed in off-white by Local 917 Shop RC Emily Larned, the essay was then shipped back to its author, who repeatedly overprinted with letterpress collagraphs in multiple colored runs. Smells delightfully like ink. 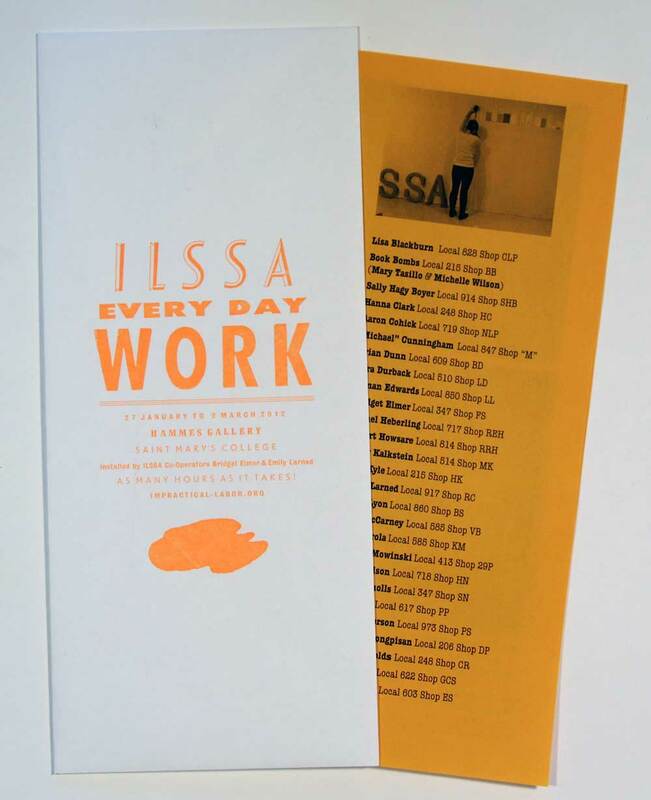 In celebration of the ILSSA It's About Time show installed at PRESS! 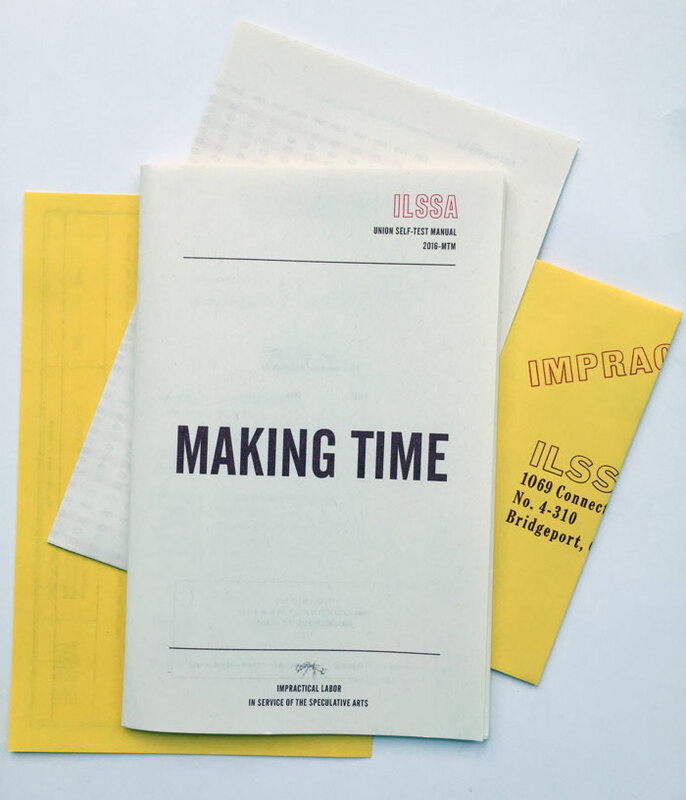 (MCLA) in North Adams MA, Publication Studio at Williams College Museum of Art (WCMA) designed and published this compilation of two of the It's About Time workbook pages: Draw lines for 10 minutes and What is the best advice about time you've ever been given? Fun to read. Handset type & letterpress printed cover by Local 917 Shop RC Emily Larned. Digitally printed pages, perfect bound; interior designed and bound by Local 413 Shop 29P Melanie Mowinski and Publication Studio WCMA's Kate Barber. 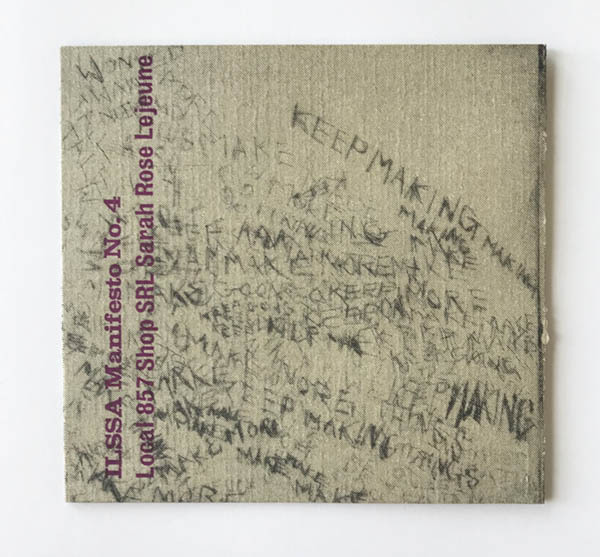 Few copies remain; reserved for the forthcoming ILSSA Box Set Vol.2. Woven poem by Local 917 Shop JB Jen Bervin on the requested theme of old/new. Risograph printed. 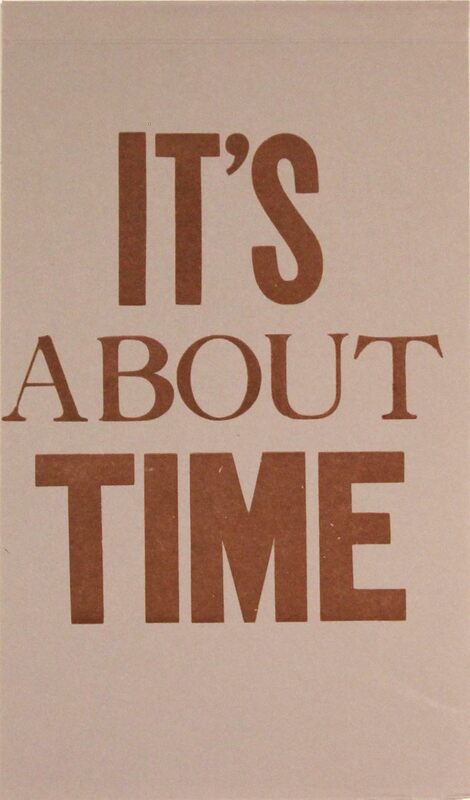 A 28-page letterpress printed workbook on the theme of time, sent to all members in January 2014. Members were invited to respond to the 28 prompts during the month of February. 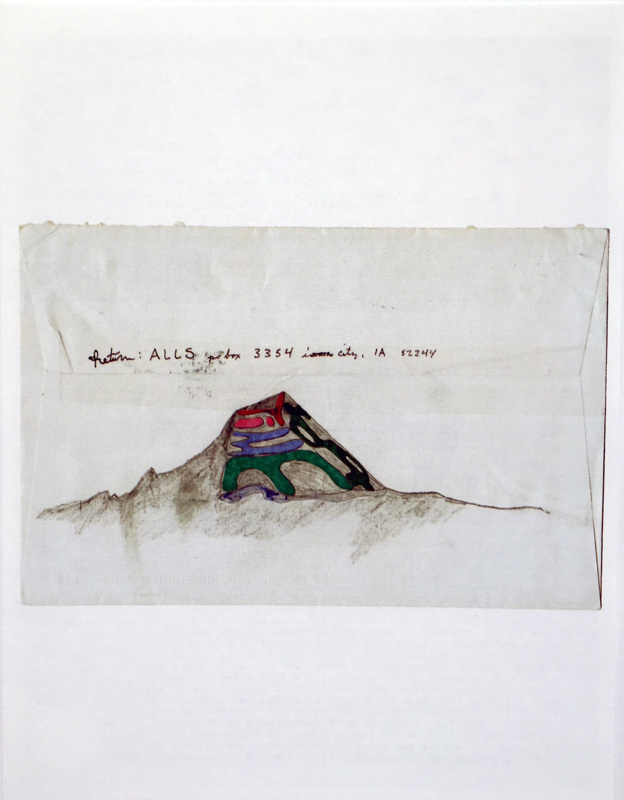 In early March, 50 ILSSA members sent their completed workbooks to the Coburn Gallery at Colorado College, Colorado Springs, for an exhibition. Since then, the completed workbooks have been exhibited across the country. Written, designed, hand typeset, and letterpress printed by Local 347 Shop FS Bridget Elmer, Local 719 Shop NLP Aaron Cohick, and Local 917 Shop RC Emily Larned. Packaged with the Coburn Gallery exhibition guide and an Impractical Labor pencil. 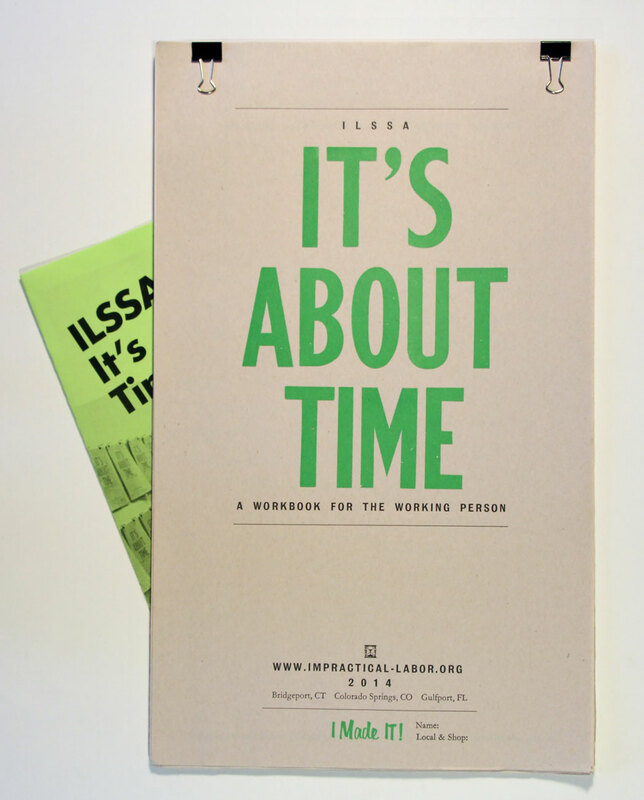 Published to document the ILSSA Convergence and ILSSA Working Group meeting in Asheville North Carolina, July 2013; now serves as a helpful introduction to the concerns and activities of Impractical Labor. Many-times-over letterpress printed file folder containing "Working Title" essay by Marilyn Zapf, Assistant Director at The Center for Craft, Creativity, & Design; an ILSSA Working Group blank notebook; ILSSA Tool Exhibition checklist; ILSSA Temporary Library exhibition checklist; Impractically Asheville Self-Guided Walking Tour map & ILSSA Convergence schedule of events by Local 347 Shop FS Bridget Elmer; official minutes from the ILSSA Working Group meeting; Working Group members' summaries; & an Impractical Labor pencil. Designed, printed, and produced by Local 917 Shop RC Emily Larned. 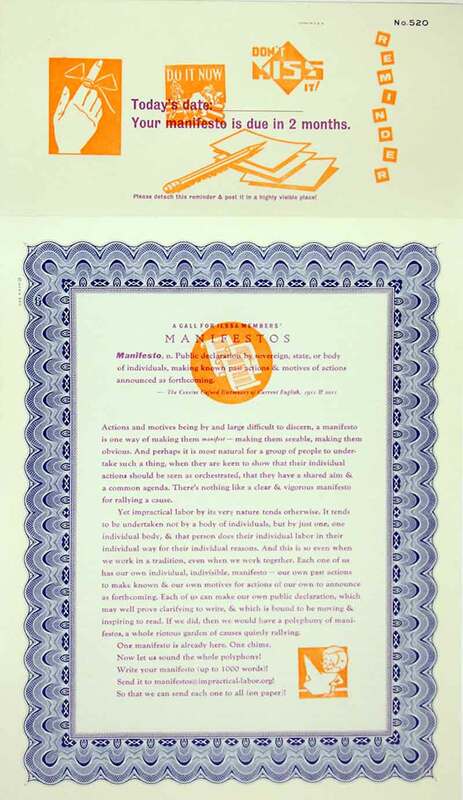 Invitation to participate in the 6th Annual Festival to Plead for Skills by submitting text & image to the newly established ILSSA Markdown on impractical-labor.org. Designed, photocopied, & rubber stamped by Local 347 Shop FS Bridget Elmer. Few copies remain; reserved for ILSSA Box Set Vol.2. 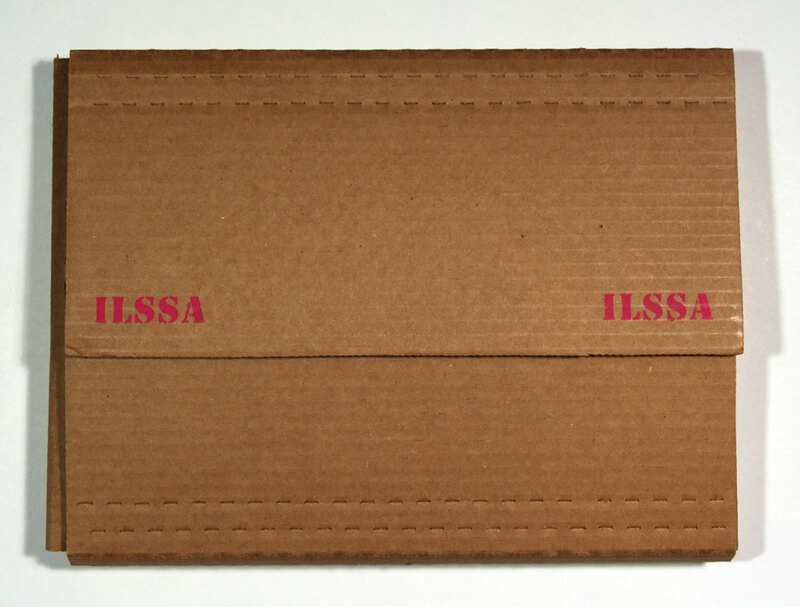 ILSSA Box Set Vol. 1. All 2008-2013 Quarterly publications below that are still in print, subject to availability, are included in the ILSSA Box Set Vol. 1. Corrugated cardboard wrapper hand stenciled by Local 347 Shop FS Bridget Elmer. 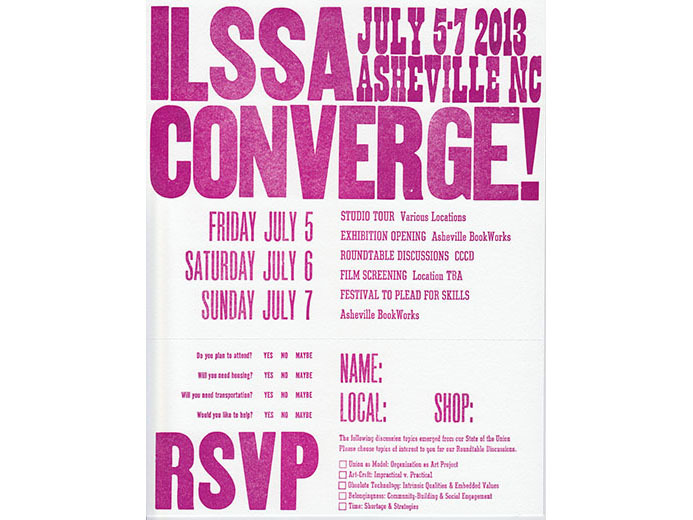 Handset & letterpress printed invitation to the 2013 ILSSA Convergence. Hand perforated RSVP card at bottom. Designed & printed by Local 347 Shop FS Bridget Elmer. Compiled report from the State of the ILSSA Union surveys. Members' responses were anonymously compiled together and carefully edited into one collective and contradictory voice of the ILSSA Union. Letterpress and foil stamped cover, detailed with stickers and rubber stamp, and bound with metal fastener. Interior designed in AppleWorks and photocopied on baby blue paper. 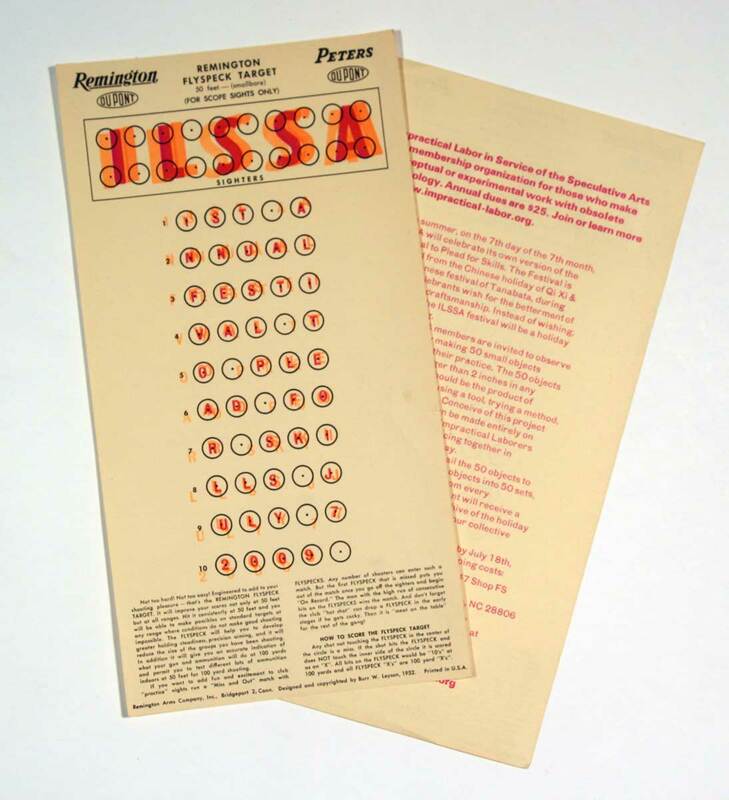 Originally packaged with the original letterpress printed survey Surveying the State of the ILSSA Union, now includes a carbon triplicate survey, and an essay originally presented at the 2013 College Art Association Conference. Written, designed, printed, and produced by Local 917 Shop RC Emily Larned. Report: 7 × 11 in. (17 pages) Essay: 8.5 × 11 in. (5 pages). Carbon Survey: 8.5 × 11 in. Download essay The Work is the Thing. The exhibition, ILSSA Every Day Work, chronicled one full year (January 1 - December 31, 2011) of Impractical Labor as practiced by a dedicated group of ILSSA members. On every day worked, members saved remnants of their process in a dated envelope. In early January 2012, members sent their envelopes and/or a representative tool to the Hammes Gallery at Saint Mary's College. One envelope was posted on the gallery wall for each worked day. On the gallery floor, the saved remnants were grouped by month, with remnants from each day organized in rows. The exhibition was a visual chronology of every day worked by union members, wherever they may have been. Together with the tools, the show provided a glimpse into the nature of such work. This guide to the exhibition lists participants and shows views of the installation. Laser printed insert tucked inside letterpress printed envelope. Designed & printed by Local 917 Shop RC Emily Larned. On the 4th Annual Festival to Plead for Skills (July 7, 2012), the ILSSA Co-Operators chronologically collated and hand-bound all of the ILSSA Every Day Work exhibition's dated envelopes into a collection of 26 books, each book consisting of 2 weeks of envelopes. The books were photographed and then distributed to all exhibition participants. Each is unique. Do you experience autonomy? How well are you challenged? Borrowing from sociology a rubric of satisfied vs. alienated labor, the 2012 State of the ILSSA Union asked all members to assess their working conditions as impractical laborers. Handset type, letterpress printed by Local 917 Shop RC Emily Larned. 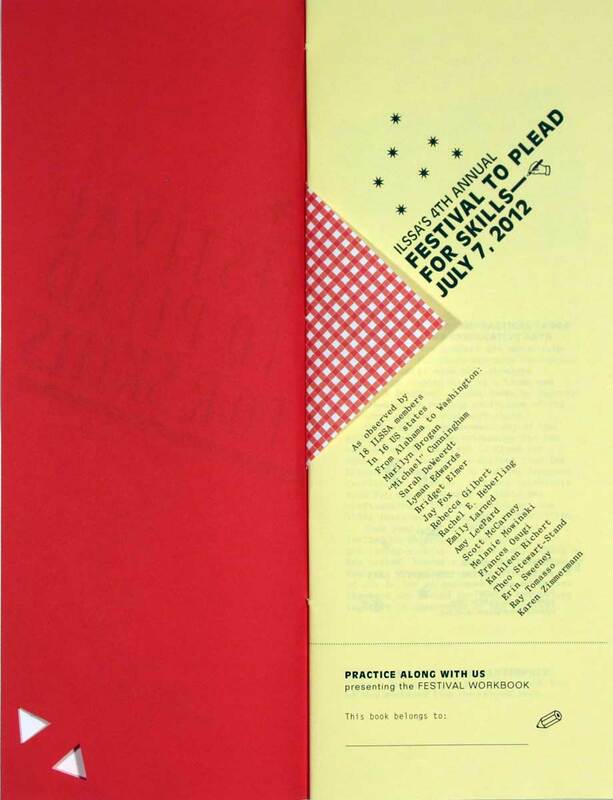 A guide and activity book made to document ILSSA's 4th Annual Festival to Plead for Skills. Top portion of booklet: participating members contributed a photo and brief caption about their festival practice. 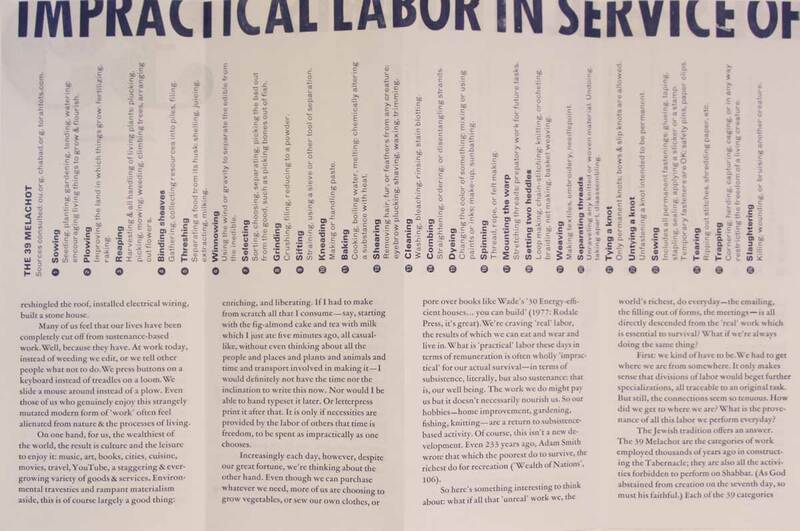 Bottom portion of booklet: an "activity workbook" suggesting new skills to be practiced by the reader. Photocopied interior, letterpress printed and hand die-cut cover, hand-sewn. Designed, printed, & bound by Local 917 Shop RC Emily Larned. Handset & letterpress printed reversible table-tent by Local 917 Shop RC Emily Larned. An early attempt at soliciting open involvement from the membership. Handset & letterpress printed invitation by Local 347 Shop FS Bridget Elmer, tucked into a hand-addressed orange envelope. A timely message for publishers. Handset metal type & zinc cut, letterpress printed on new old stock "While you were out" pink memo slip. Designed & printed by Local 917 Shop RC Emily Larned. Original edition out of print. 2nd edition (2016) $2. Designed by Local 347 Shop FS Bridget Elmer. Produced in collaboration with All Along Press and Washington University. Distributed at the 2011 SGC International conference in St. Louis, MO. 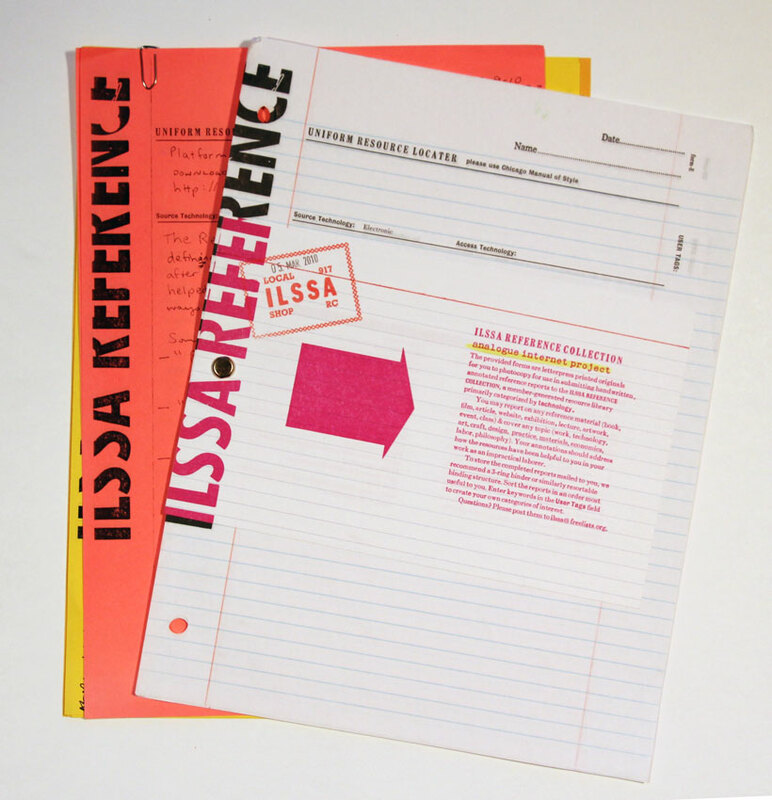 The ILSSA Reference Collection was a collaboratively generated annotated bibliography of ILSSA-relevant reference materials. 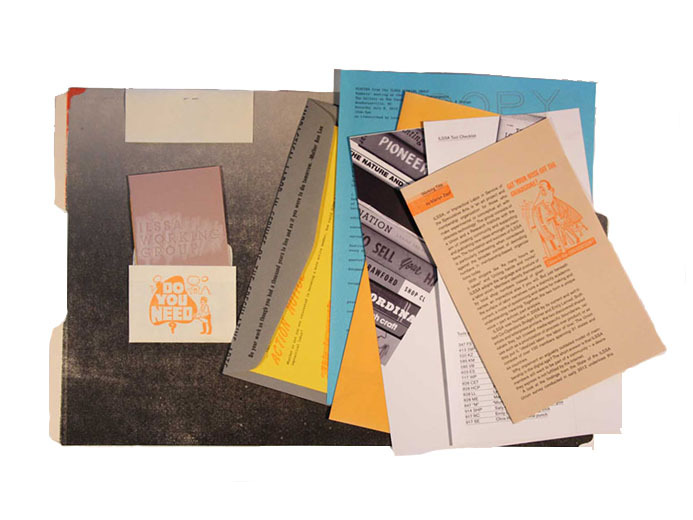 The printed work consists of a letterpress printed index card offering an overview of the project; 4 original letterpress printed forms on ruled paper; and photocopied, color-coded forms of resources submitted by members. 9 pages + index card bound with brass fastener. Project now retired, but submissions are archived in the ILSSA Library. Designed and printed by Local 917 Shop RC Emily Larned. Hand-sewn double pamphlet do-si-do notebook with letterpress printed covers, ruled paper inside; two printed bookmarks coordinating with the two different colored front and back covers. The bookmarks each proclaim In support of your bibliographic endeavors, we offer you the ILSSA Notebook & Bookmarks. The pamphlet & color-coded bookmarks are designed to accompany you on your reading & annotating adventures. This notebook was designed to enable the taking of notes in two different books at the same time. The cover "composition book" pattern was created by marbling paper, and then making a polymer plate from that paper, printed letterpress. Designed, printed, and bound by Local 347 Shop FS Bridget Elmer. For the 1st annual Festival to Plead for Skills, participating members observed the holiday by practicing a skill that resulted in a 2 × 2 in. object. Members sent these objects to Local 347 Shop FS Bridget Elmer, who collated them into sets. 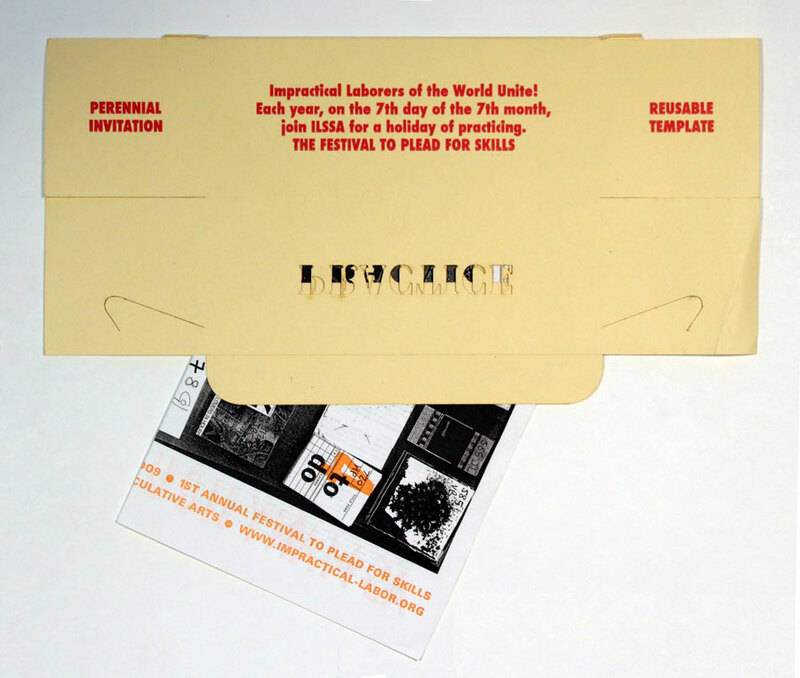 When the Festival sets were distributed to participating members, they were accompanied by these two publications: a laser-cut and letterpress printed perennial invitation that is also a template to make a box to house the objects (by Local 347 Shop FS), and a photocopied and letterpress guide to the set's contents (by Local 917 Shop RC Emily Larned). Local 347 Shop FS Bridget Elmer designed and letterpress printed this renewable membership card, with the years 2008-2025 printed on the back. In 2009, all impractical laborers were invited to participate for the first time in ILSSA's annual holiday, the Festival to Plead for Skills. For this inaugural invitation, Local 917 Shop RC Emily Larned engaged in letterpress target practice by printing on paper targets: she set the type by hand and locked it into the press, eyeballing the position of the type and the target. 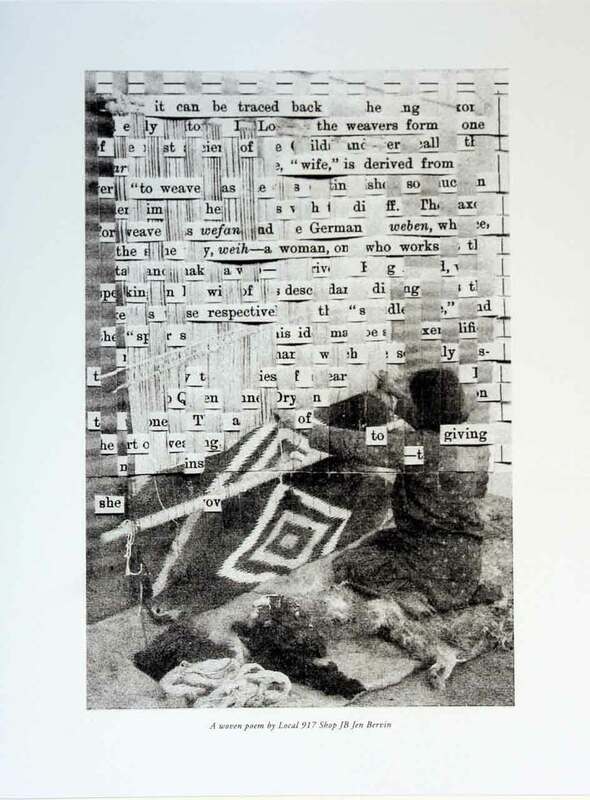 Each time she made a spacing adjustment in order to make the type "hit" the target, she ran the entire edition of targets through the press again. Once registration was perfectly aligned on the paper target, she changed the ink color from orange to magenta and printed one more time. Targets are vintage new old stock found in the abandoned Remington Arms factory, Bridgeport, CT, before it was destroyed. 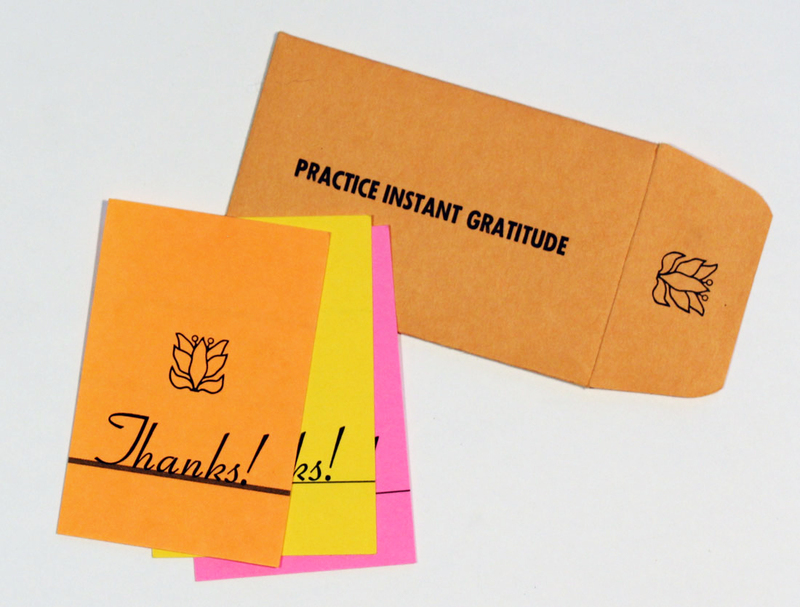 Small thank you cards to be passed out spontaneously when needed, housed in a small printed envelope. Handset type, letterpress printed by Local 347 Shop FS Bridget Elmer. It is not so much the exercise that is practiced as the manner in which it is practiced. Some helpful advice extracted from the Palmer Method of Business Writing. Handset type, letterpress printed by Local 347 Shop FS Bridget Elmer. Essay about the primordial origins of everday tasks, as illuminated by the 39 Melachot. Handset type, letterpress printed by the essay's author, Local 917 Shop RC Emily Larned. Published in ILSSA's largest edition to date: 500 copies. How do we reclaim happiness from desire? Essay handset in metal & wood types and letterpress printed by its author, ILSSA Co-Operator Local 347 Shop FS Bridget Elmer. Original edition (letterpress) out of print. 2nd edition (photocopy) out of print. 3rd edition (Riso) forthcoming. What is craft and why does it matter? 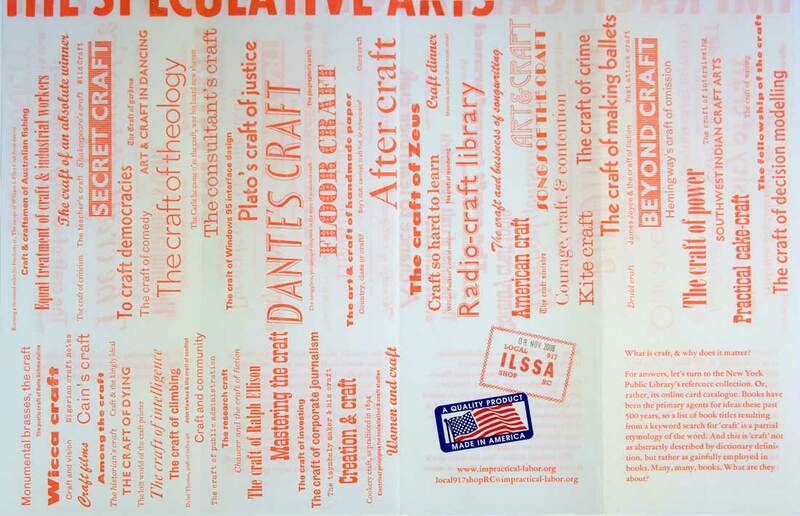 An exploration of the many meanings of craft through a perusal of the book titles in the NY Public Library's card catalog. Essay handset in many, many, many metal & wood types and letterpress printed by its author, ILSSA Co-Operator Local 917 Shop RC Emily Larned. Few copies remain; reserved. 2nd edition (Riso) forthcoming. The only freedom is freedom from want. Or: Is freedom from want the only freedom? Reversible poster handset in metal & wood type and letterpress printed. Corner details laser printed. 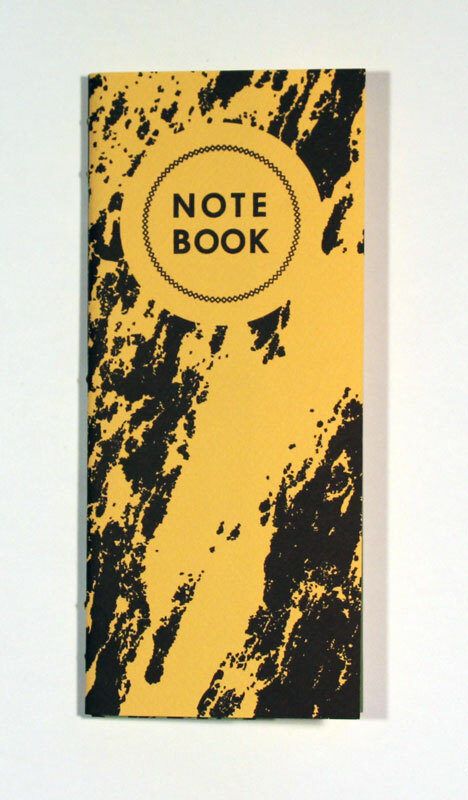 Originally created by Local 917 Shop RC Emily Larned as a giveaway for the ARLIS conference at MoMA (NYC) in November 2009, during which she presented at the "Artist Books from the Brooklyn Perspective" panel. Handset type, letterpress printed by Local 347 Shop FS Bridget Elmer. 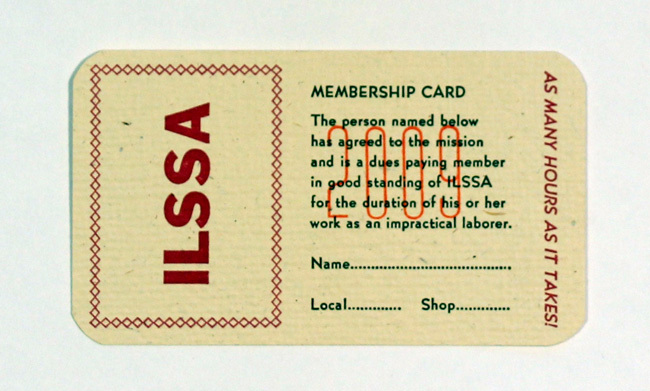 The only one-year membership card issued by ILSSA.